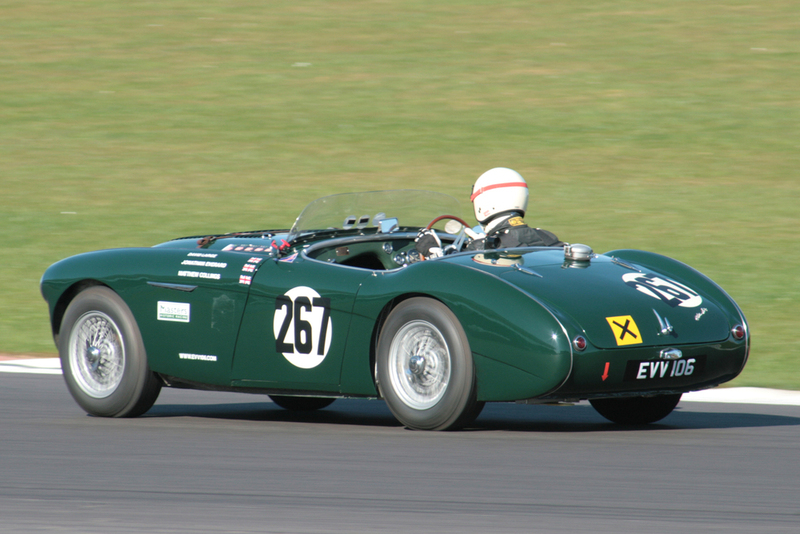 Chris Woodgate takes Mark Midgeley's DB3 ahead of Spike Milligan's HWM Jaguar on the way to a narrow victory. George Abecassis, the well-known and highly respected British racing driver, whose racing career spanned the war years was born in March 1913. He retired from motor racing in 1956 and died in 1991. FISCAR was hugely honoured to be asked by his son, David, to help put together a grid of suitable cars and find a club who would be prepared to run it, in order to celebrate the Centenary of George’s birth. The intention was to provide a race for only those types of sports cars that George actually raced in period, and was thus restricted to Alta, HWM, certain Aston Martin and Austin Healey 100 models and Healey Silverstones. The race, split into the 5 marque classes was, as a result, to be by Invitation only and in order to achieve a good sized and representative grid, any invitation declined was replaced by another. It meant an early start to the invitation process in order to ensure that we had sufficient acceptances to provide a quality grid. The race was to be of 40 minutes duration with a compulsory pit stop, enabling second drivers to take part if desired. George was closely associated with the BRDC and Silverstone, so it was the logical venue for the race to be run at. Since the VSCC run their Spring Start meeting there and it is close to George’s birthday, it seemed entirely logical that they should be approached in order to run the race. Our request coincided with the VSCC decision to extend this popular meeting into a two day affair this year, which increased our hopes that a place for this race would be made available. Very fortunately, they acceded to this request and to cut a long story short and after months of effort assembling a representative grid, race day arrived with a high quality entry, despite a few cars dropping out along the way. FISCAR was well represented, existing members providing almost 50% of the race entry. We were delighted also to have a strong contingency from Germany who made the great effort to be there for this celebration. It was a beautifully warm and sunny day for the VSCC’s first race meeting of the year and this only served to enhance our grid and the wonderful display of HWM and ex Abecassis cars assembled by David in the paddock, in a prime location kindly provided by the VSCC, and adjacent to the superb hospitality unit supplied by our sponsor, Woolmer Classic Restoration. 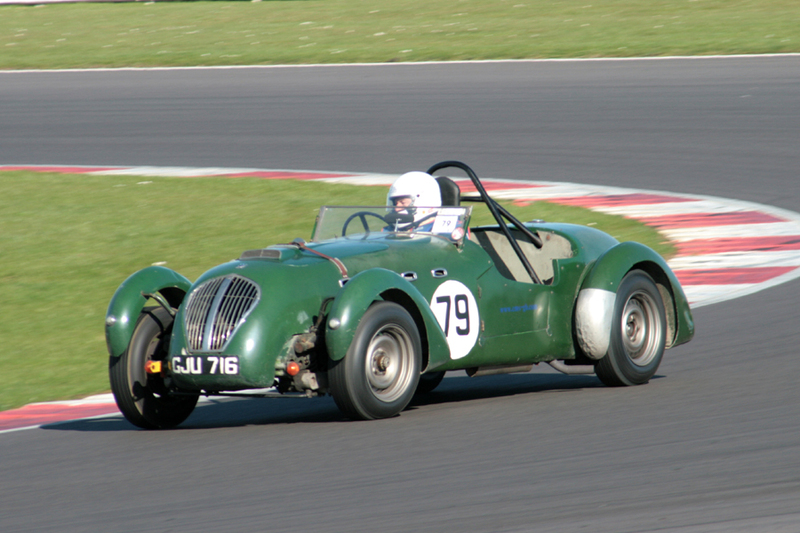 The expectation that an HWM Jaguar would annex pole was scuppered in practice when against the script, Peter Thornton, sharing with David Garrett, put his Austin Healey 100S on pole. He was joined on the front row by Wolfgang Friedrichs in his beautiful Aston Martin DB3S and on the second row by late entrant Mark Midgley, sharing his DB3 with Chris Woodgate. The first of the HWM’s, lining up fourth, was Spike Milligan’s with the Roger Buxton/Michael Steel version lining up a lower than expected 7th. The HWM impact on the grid may have been different had Matt Grist’s HWM 1 practiced, but unfortunately, this had succumbed in testing the day before and was, in effect, our first retirement but remained a silent but imposing presence amongst the stationary exhibits. Lining up behind Spike, on row 3 were the closely matched DB2s of David Reed and Andrew Sharp. Sam Stretton made a splendid job of putting the Alta Sports on the fourth row alongside the HWM, but he was not to start the race since it also ran in the earlier Fox and Nichol race during which it suffered a cracked cylinder head. The top ten qualifiers were completed By Matthew Collins in his Austin Healey 100M and upholding family honour, Jonathan Abecassis in his 100/4 version. 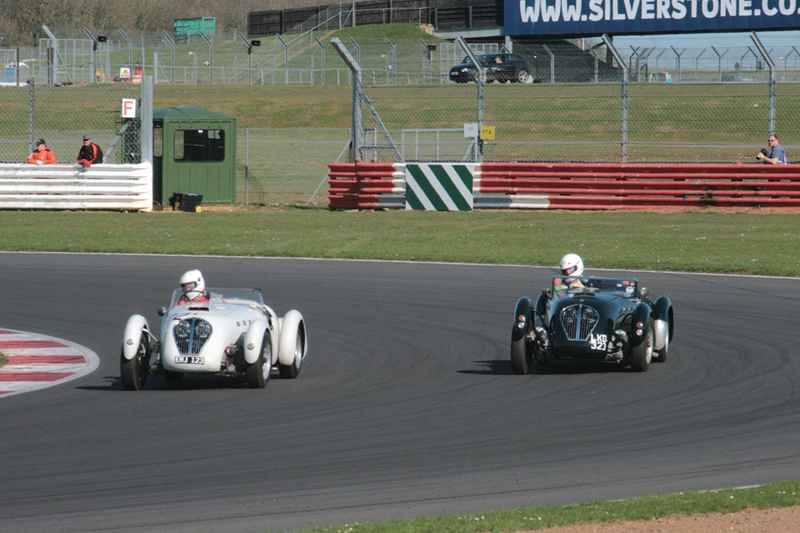 Battling Healey Silverstones of Neil Collins and Till Bechtolsheimer. The middle of the grid was filled by a wonderful entry of no less than 5 Healey Silverstones, the quickest of which was that of Grahame Bull who qualified his 11th overall. Esconced in the middle of this sea of Silverstones was the Austin Healey 100S of David Large and further back we had the rare sight of a DB2 convertible driven by Charles Bell and Tim Stamper, Charly Willems in his HWM Jaguar Alta, Helmut Rothenberger’s famous ex works DB2, VMF 64 (Sister car VMF65 was in the paddock exhibition), and Graham Galliers Alta Sports, driven by John Polson, which was to be the only Alta to start the race. Last but not least was the unique and beautiful HWM Jaguar GT Coupe, a car not built for the track but the last HWM ever built and the brainchild of George Abecassis both in design and construction and exotically clothed in a shape penned by Frank Feeley. It just had to be there and was driven by Philip Schnedler! Martin Melling practiced his ex Abecassis DB3, complete with original ‘cooking’ engine, whilst the race unit is being rebuilt, out of session, and was able later to take his rightful place on the grid. Sadly, Matthew Collings was unable to bring his Austin Healey 100M to the startline which meant that we had lost 3 cars that had arrived for practice. Such failures go with the territory, of course, but it must have been very frustrating for the drivers/entrants concerned. This fabulous selection of cars emerged from the Paddock onto a grid bathed in sunshine from an almost cloudless sky and presented a spectacle that I can only hope stirred all those looking on. At the start, all of the good work by the poleman was undone when the 100S bogged down causing a few awkward moments for those behind and particularly for Mark Midgley who incurrred some damage to the DB3 but he pressed on regardless. Whilst all this was going on, Spike Milligan made what he described as one of his best ever starts and took the silver HWM into a lead and was already several car lengths clear at the end of the first lap. Behind him came a quartet of squabbling Astons led by Friedrichs in the DB3S closely attended by the DB2s of Reed and Sharp, with Midgley’s DB3 latched firmly to their tail. Dicing was also apparent down the field amongst the Healey Silverstones and Austin Healey’s with Bull’s Silverstone running very strongly amongst the later cars. The Thornton/Garrett 100S started its long recovery drive and much to his delight, Abecassis was able to go with it, in his 100/4, even briefly getting ahead. Meanwhile, at the back the HWM Coupe circulated steadily on road tyres. The Alta, however, had suffered dramatic power loss in practice but John Polson had taken his grid place at the start, completed one slow lap, pitted and attempted another, but the car was clearly in distress and John pitted it for a second time, into retirement, so that any Alta involvement in this race sadly ended very early. The Alta heads for the pits and into retirement as the leading 4 cars start to lap the backmarkers. Back at the front, Milligan had eked out a lead of a few seconds whilst the battling Astons behind sorted themselves out. They ran close for much of the early part of the race but did eventually adopt a line astern formation at which stage the gap to ‘Spike’ stabilised and with Sharp leading the charge and beginning to put daylight between his DB2 and the rest of that chasing group, appeared to come down. The HWM however, remained tantalisingly out of reach and in his attempts to close in, Andrew spun the DB2 out of Brooklands. Whilst his recovery was rapid, it did not prevent Friedrichs, Reed and Midgley slipping passed although he was immediately back on their tail as they exited Luffield. Such was the pace of the leading 5 cars that not only had they started to lap the slower cars by lap 5, but David Garrett in Thornton’s pole sitting car could make little headway in recovering the ground lost at the start. Nor indeed did the Buxton/Steele HWM Jaguar seem to be making the anticipated progress forward. Jonathan Abecassis headed the Thornton/Garrett Austin Healey 100S but only briefly! With minor adjustments the status quo was maintained after the pit stops but we were to enjoy the spectacle of a couple of hard charges towards the front in the second half of the race. Mark Midgley, nursing a recently operated upon knee – he’d only driven his road car for the first time a week or so before the race – did a sterling job keeping his DB3 in contention and then handed over to Chris Woodgate. Chris immediately started to make inroads into the lead still held by the Milligan HWM. At the same time, Peter Thornton took over his Healey 100S and he, too, started to make up ground. Sadly, by this time, we had lost two of the Healey Silverstones; those of Steven Pryke, after 8 laps and Till Bechtolsheimer’s after 14 laps. Till’s car was primarily a rally tour car but had it prepared for this event and he had flown over from the States especially to participate, so it was poor reward for all his effort. 'Spike' Milligan led for most of the race but was just pipped at the end. His best lap was by far the fastest lap of the race. A fine drive by Grahame Bull netted him 9th and a class win in his Healey Silverstone. The above four cars were also their respective class winners and at the award ceremony conducted by David Abecassis, received their awards from his daughter, Marie Nazombe. No award was given for the Alta class as there was no finisher in that class. I wish to thank David Abecassis for giving us the opportunity to put this grid together, a grid in which he had a very big part in building and also for organising single handedly, the excellent static display. Thanks must also go to the VSCC for allowing this race to be part of this very popular and busy racing weekend and to Mark Campbell for not only making the initial approach to VSCC but pointing me to some cars which weren’t on my original ‘hit’ list. Paul Woolmer of Woolmer Classic Restorations provided excellent hospitality facilities and last but not least a huge thanks to all competitors who entered and contributed to making what I hope was a memorable and special event, particularly for the Abecassis family.